1967 Plymouth Belvedere II with a 440 motor and 727 auto transmission. Rare black and silver interior and vinyl top. You have a great looking car. More details? All original sheet metal with solid frame and body. I found the car in Tennessee but it was originally from Conn. It has a 1967 dated coded 440 with a mild build. Rear gears are 293 so great on the highway. Great looking car, the 67's were so clean looking. 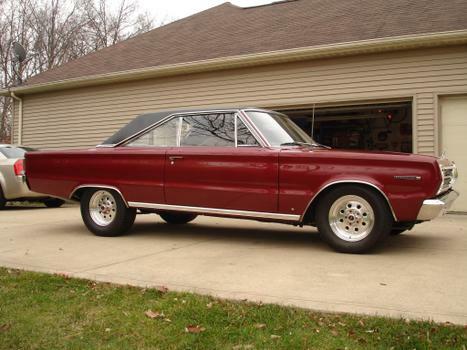 My friend had a 67 Hemi GTX 4spd back in 68....what a ride! No mine does not have the certa card but I do have the factory build sheet. what mileage are you getting with the 293 gears with that 440? I never really checked the miles but I know it's better than the 323 gears I had in my 65 Coronet. That car only got 11-12 miles to the gallon in the city. Dude, I swear you stole my car until I checked my garage. It is still there. I have a carbon copy of yours. Vinyl top, Silver special inside, even the same color outside. Contact me. Had one the same color combo with 383, 4 brl carb, 4 speed, 392 gears. Wish I still had it! Thanks, I really do like the color combo and it certainly is different, even among the Mopar crowd. I wish mine was a 4 speed also. My interior code is also H4a. I am trying to locate material. Did you find the material anywhere. I am looking for the same?? uto Interiors did have the Silver Special interior kit and the vinyl top available. My friend had a 2-door 383 A/C Silver Special around 2005. He got the interior kit and vinyl top and it was very accurate and great quality. no luck yet on the material. Everthing is listed as black and silver. My original material is silver on the sides like the beautiful car shown, but the center looks more dark metalic navy sort of. Love the car but have a question. Is the TRM code on the fender tag the indicator for the interior? If so I have H4A as well. My car is Polar White with the black silver vein top. The interior can be purchased at legendary interiors. Every piece of it. They do not include the seat emblems. I also have a 67 silver special decode by Galien. 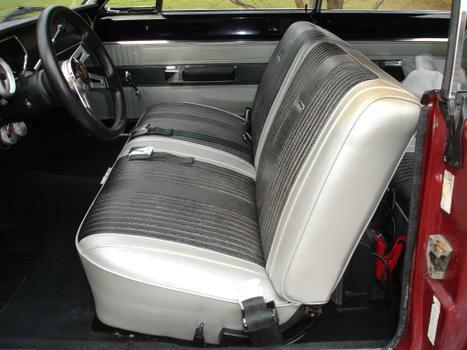 My interior is the same as yours and the vinyl top appears to be the same as yours. Question: I just purchased a nos top from Legendary and it is the opposite of mine, I.E. black in the gran and mostly silver on the raised portion of the vinyl. They say that was the only roof available. Can any one verify? I recently replaced my top with a black style type since that is all that was available anywhere.